The forecast was not good for riding the rail trail today – 50% chance of thunderstorms and it was more like 100% thunderstorms. We did not go to Fayetteville because we wanted to wait until we could do the rail trail. Some of our team members went to Fayetteville to shop and said it poured rain there too. Maybe we can go next weekend. 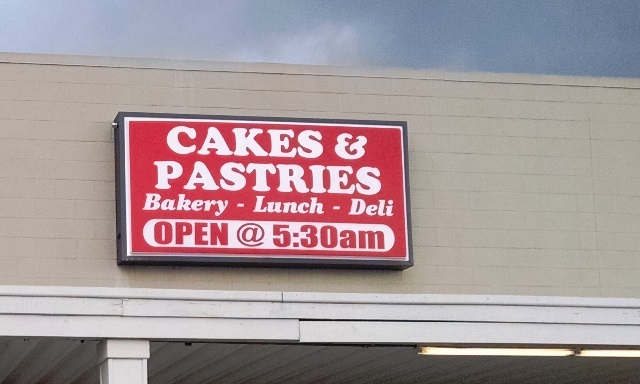 So since we were staying in Lumberton we found the local pastry shop that gets really good ratings, Cakes and Pastries Unlimited. We now know why they get good ratings. Mmmmm good!!. 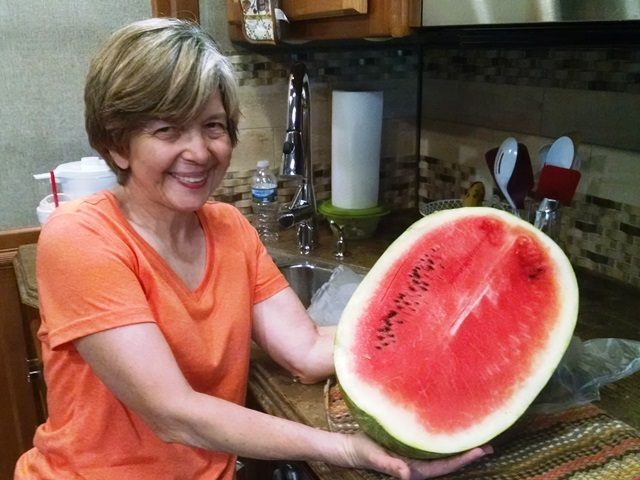 We also stopped at a local truck on the side of the road a little ways from the camp site to pick up a really good watermelon. Otherwise we did some paperwork getting ready for next week and got some rest. A nice quiet day. For those of you that were following us at the Constructors project in Rosalie, they made a lot more progress last week. The pictures from there continue to be exciting. Hope everyone has a great weekend and stay safe this holiday weekend. Today started with another really nice sunrise. Morris and Karen hosted us at their RV (also a Tiffin) for today’s devotion since he was using a video had everything set up in their rig. Devotion was based on Romans 5:6 and we were encouraged to Walk Across the Room – to witness, to fill needs. We were reminded that when we walk onto a project we are witnessing. Morris also used a music video by a friend of his, Tommy Brandt, a country music singer who always ends his performances with an alter call. It was then back to the job side and a day of hard work. Max and Anne first worked on the laminate flooring to work around a door then Anne and Suzanne took over on the laminate and Max worked on the trimming out the steps we built yesterday. 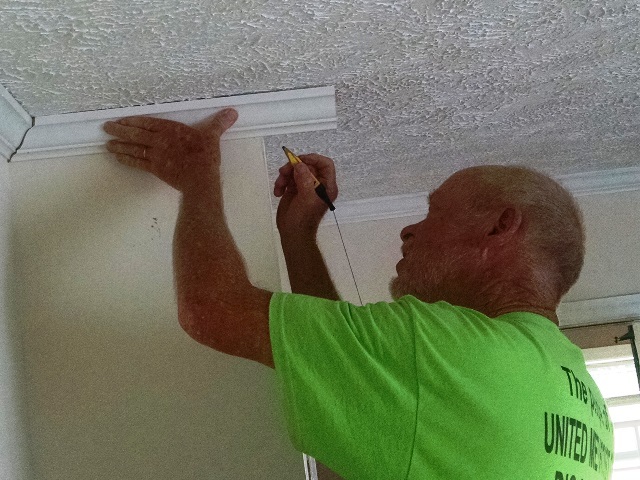 Morris also worked on trim most of the day. 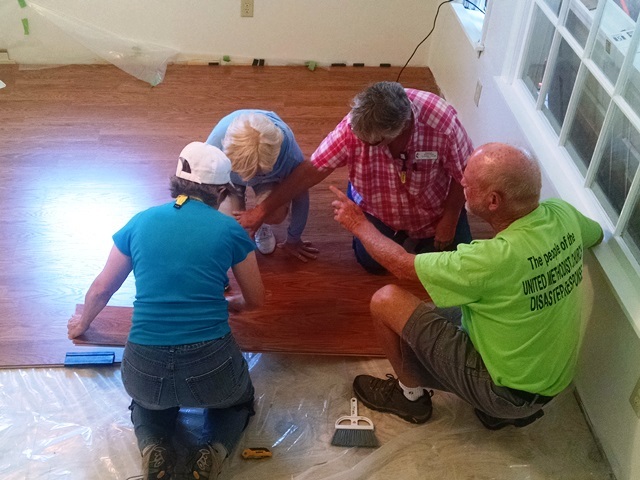 Karen painted part of the day and then joined the ladies working on the laminate flooring. Toward the end of the day the girls were getting pretty tired and Max again returned to help with the flooring. Mike filled in where ever needed but he also spent a lot of the day painting. So, at the end of the day the bedroom laminate flooring was complete, the sitting room was painted, the steps complete except for paint and almost all the trim was up in the sitting room and we were all really tired. We made up for all the time that was spent on the Governor yesterday rather than working. There will probably be some ladies with sore muscles tomorrow. Today was Mike’s last day with us. He will be returning to Michigan early in the morning and Max and Anne will take over leadership of the project. Since it was Mike’s last day we went to a new Mexican restaurant tonight. 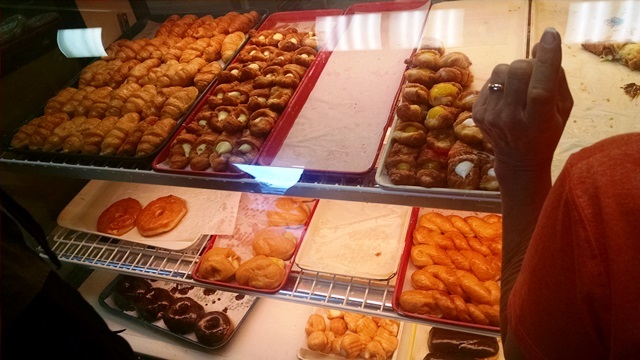 The food was goo and reasonably priced. We were glad that Jeff and Ann the coordinators were able to join us as well. We really appreciate the good job Mike did and pray for safe travels tomorrow. We hope to see him and his wife in Iowa in September. Since today was NOMADS Friday, we will now look to deciding on weekend plans. We had hoped to go to Fayetteville to ride our bikes on a rail trail there but the weather is now looking iffy for outside activities so we will decide tomorrow. We hope to spend part of the weekend just resting. Author rvingwithapurposePosted on June 29, 2017 1 Comment on Busy Day! Today started normally enough. 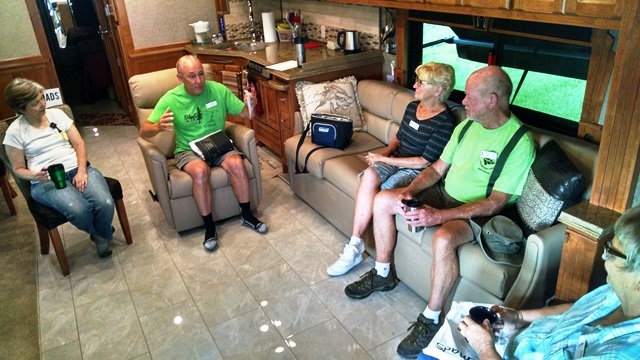 It was a sunny morning and the team arrived at our motor home for morning devotions right on time at 8:00. 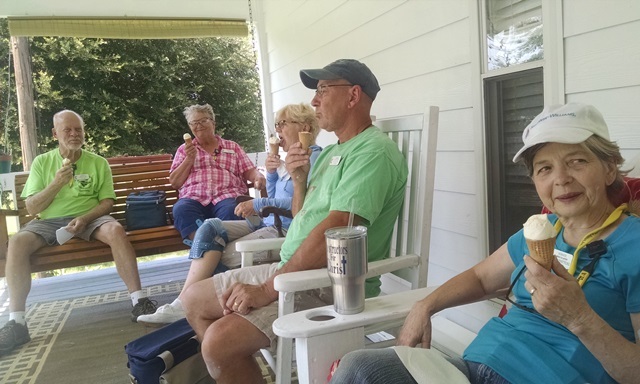 We had a visitor for devotions, Ann Wade with the North Carolina Conference Disaster Recovery. 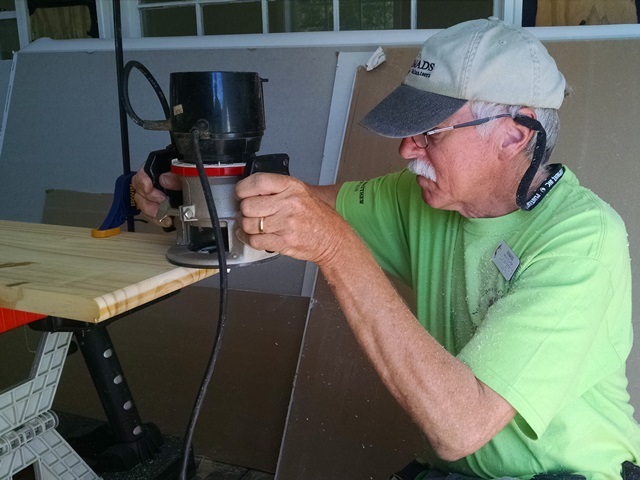 Ann and her husband, Jeff, head up the volunteer coordination and supervision of the rebuilding in the homes in the Lumberton area for the NC Conference of the UMC. Ann brought T-Shirts for all of us to wear today while the governor was touring. Guess we should have expected something was up. She did say “the event has grown a little.” So we presented our devotion today on “How Do You Stop A Hurricane?” The answer is that you stop it with land. We as Christians are called to be the land in the lives of others experiencing tragedy/difficulties and things like flooding from hurricanes. We are called to be there for them and help them recover in any way we can from making donations, to helping rebuild their home, to just sitting and listening to them tell their story of the night they lost everything. That’s how we can be their land. After devotion we headed to the job site to begin our work day. We basically started where we left off yesterday. Max and Anne completed the steps. 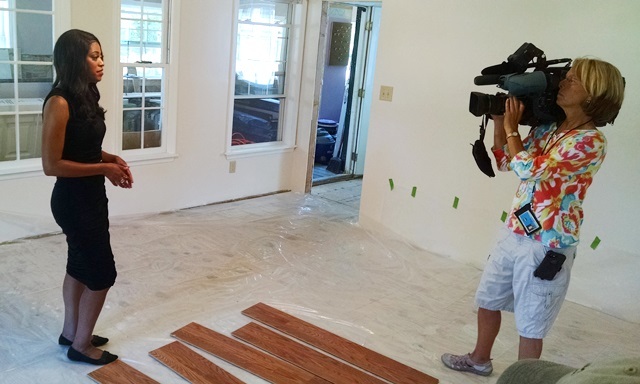 Suzanne worked on caulking, Karen on painting, Morris on bathroom trim and Mike started preparing the bedroom for flooring. 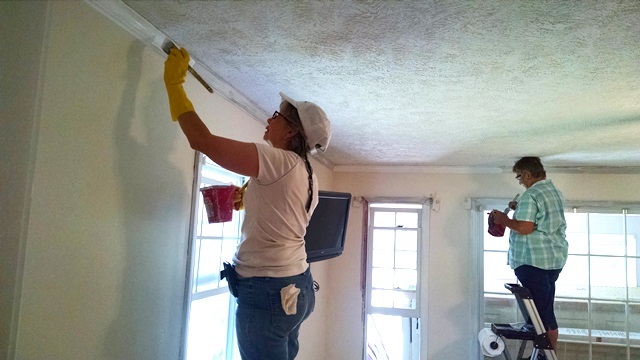 Homeowner Mary Elizabeth and her daughter-in-law Elizabeth were also painting. 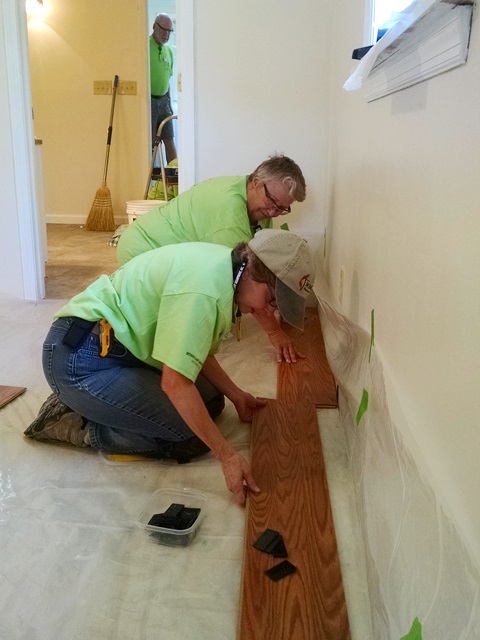 Mid-morning Anne, Max and Suzanne began work on the laminate flooring in the bedroom. Then the circus arrived! What we thought would be a few people turned into about 50. From our prospective it was nice to get to meet the North Carolina State EMA Director, who knows our friend and Alabama State EMA Director Art Faulkner. We had a nice, short visit. 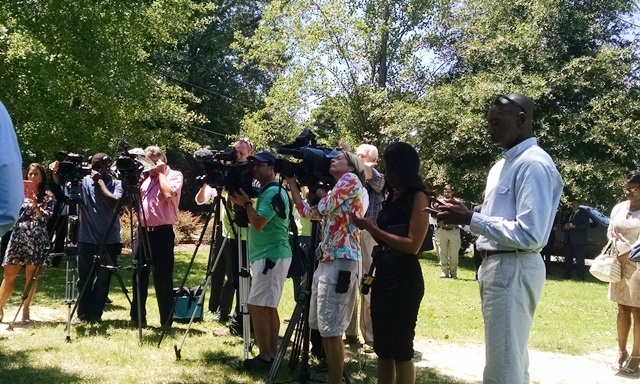 Governor Roy Cooper had a press conference on the front lawn of our work site with multiple TV stations and print media on hand. He used it to announce funds to support the faith based volunteers working in the state and more funds to prevent future flooding of the area. 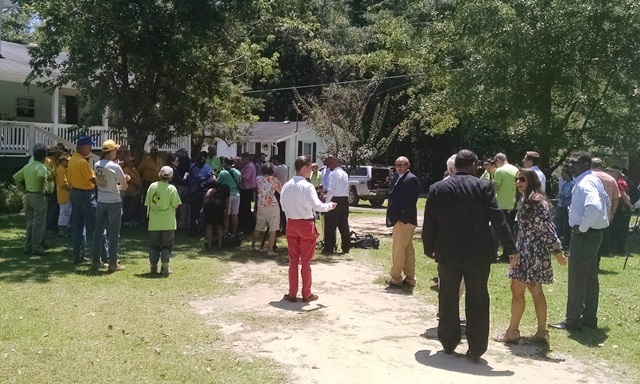 The NC Baptist group and NC Methodists were recipients of some of the funds and were present at the press conference. 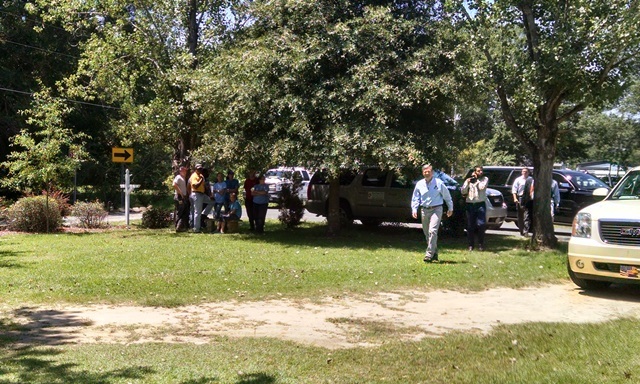 All the media and the governor’s party toured our work site and were, of course, very nice, thanking us for all we do. You can view one of the news segments here. It was after 2:00 pm before all the craziness resolved and we could return to work so not a lot was accomplished today… but it was a fun day and fun to see ourselves on the new tonight. We will try to work extra hard tomorrow. Today we continued our work on Mary Elizabeth’s house. 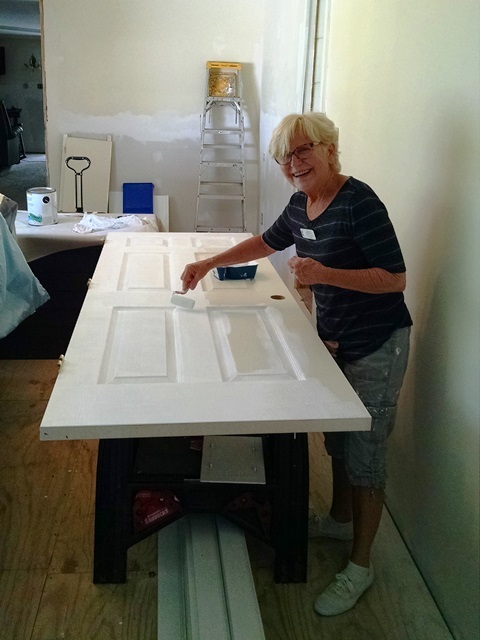 Suzanne, Karen and Anne continued their caulking and painting while Morris and Max installed the last closet door and Mike began cleaning and reinstalling outlet and switch plates. 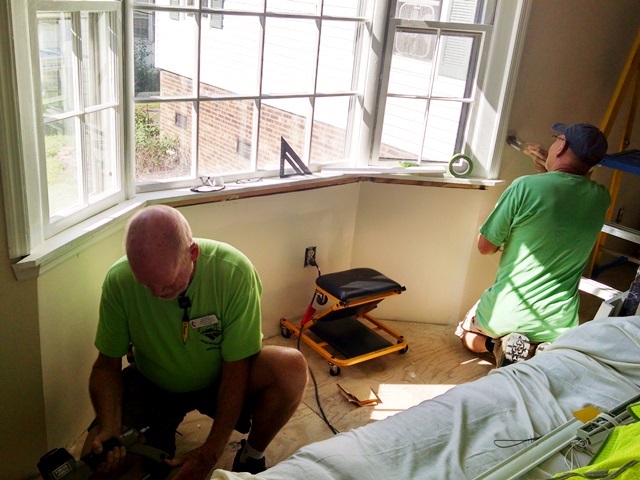 After the door, Morris worked on the baseboards in the bathroom and Max finished the window trim in the laundry room. 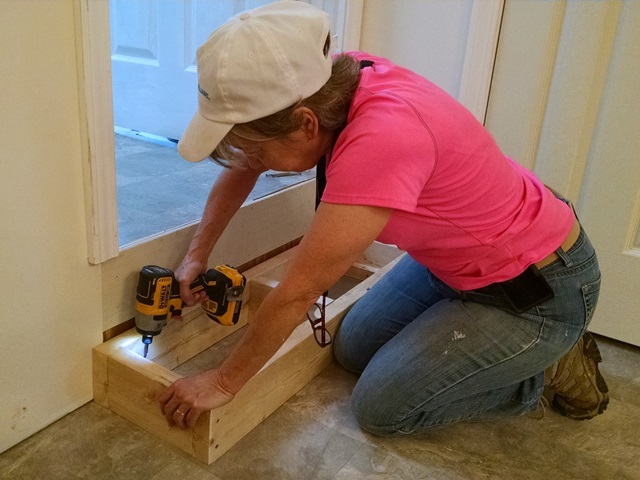 After lunch Morris installed door knobs in the new doors while Anne and Max worked on building the steps connecting the front part of the house with the back. It doesn’t look like much when we put it on paper but we worked really hard today. 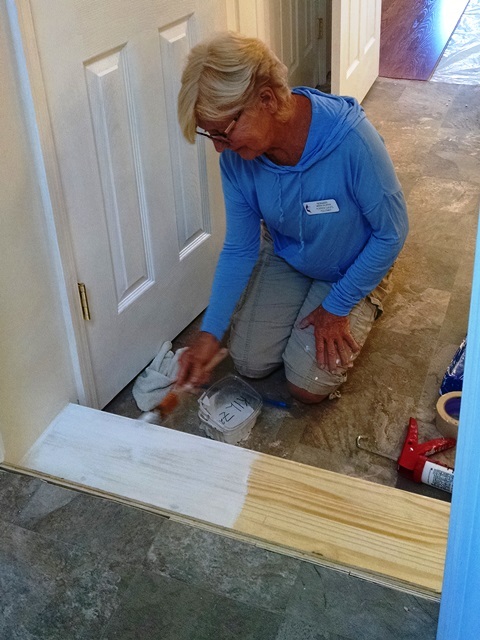 It is our hope to quickly now finish up the bedroom, bath and closet so Elizabeth and her husband can move back into their apartment and allow Mary Elizabeth to have her space back upstairs. 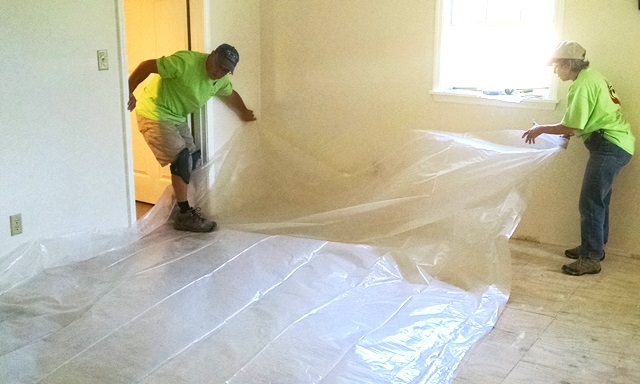 The largest project left in their apartment is installing the laminate flooring. We think we will finish up the steps then start that installation in the morning. Should be another busy day and we are hoping to have some pictures of the flooring tomorrow. 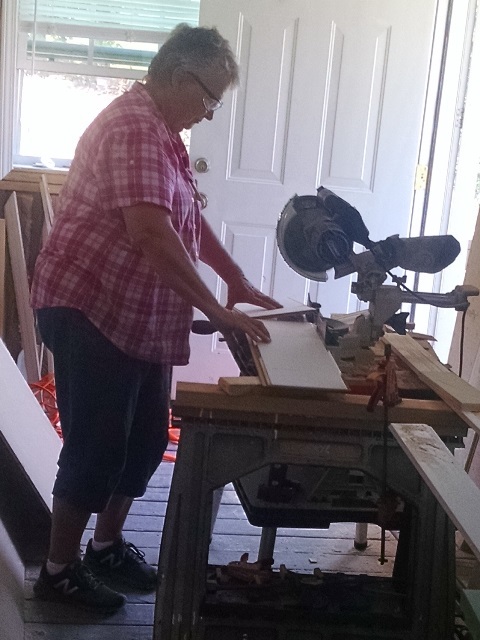 Anne reading instructions for laminate flooring out loud to everyone. One nice thing about working on this house is the wonderful front porch where we take our breaks It seems to always have a cool breeze. 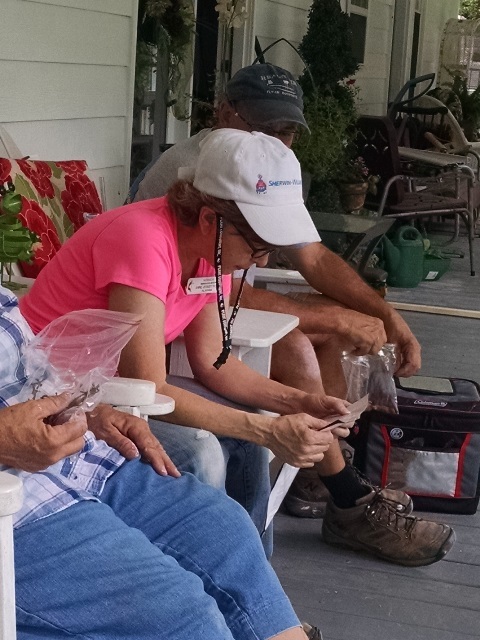 Another is how hard Mary Elizabeth works right along side us to repair her home. Her daughter-in-law Elizabeth also works with us when she is there. They are so anxious to have their home and life back. 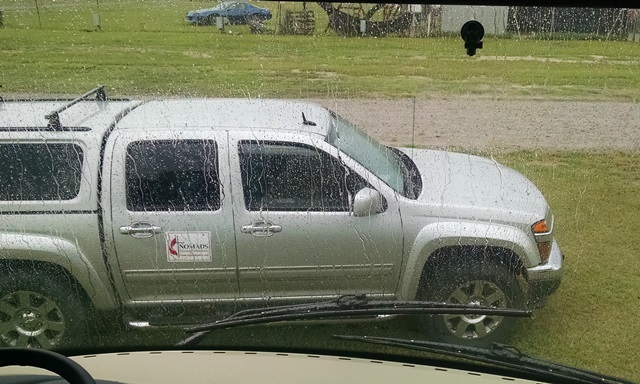 Driving around town you see homes everywhere with volunteers working to help restore peoples lives. 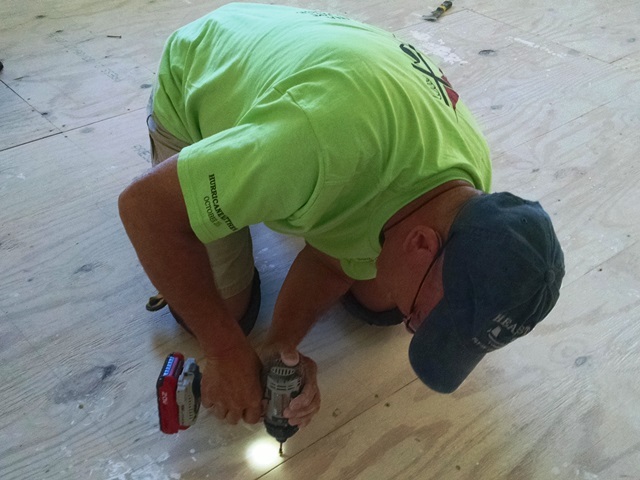 The North Carolina Methodist Disaster Relief team has over 100 people in town this week working on homes. 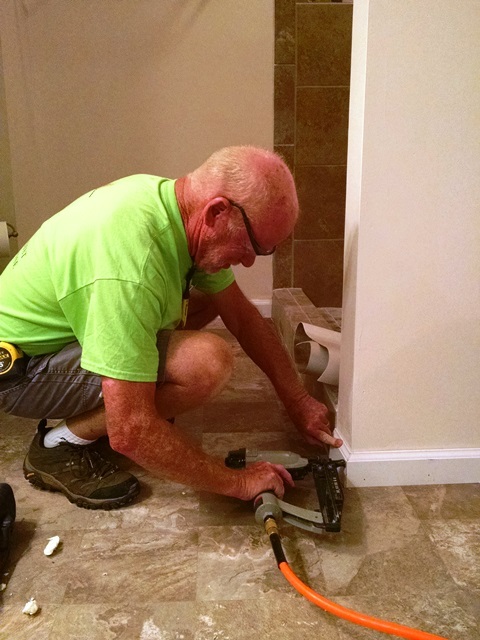 The Baptists are also working on several homes but we don’t know how many are here this week. There are probably other organizations here as well but we just haven’t met them yet. It’s peach shake season at Chick-Fil-A so that’s where we went after work. As usual for a NOMADS project our day started at 8:00 am with morning devotion. 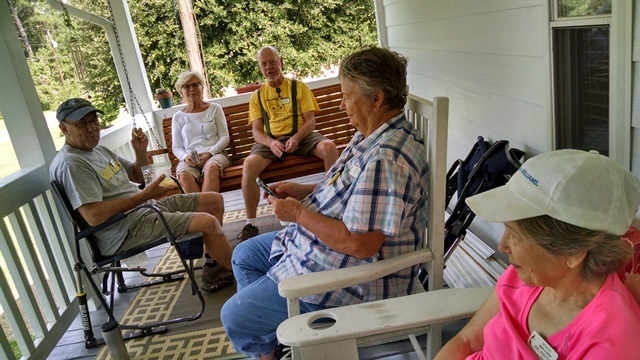 Mike, our team leader for the week, provided our message today from a one of Rick Warren’s “Daily Hope” posts entitled “Laugh, Play, Pray, and Hope.” We then discussed the day’s work and proceeded across the Interstate to Mary Elizabeth’s house. Her house was flooded about 2.5 feet above the floors. This is a multi-family house that has been almost completed by other volunteers and our team plans to finish it. 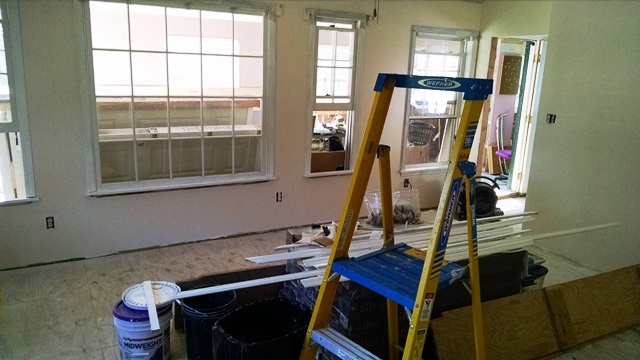 Our first priority is to finish the downstairs living area so that the daughter and her husband can move back out of Mary Elizabeth’s upstairs living area. 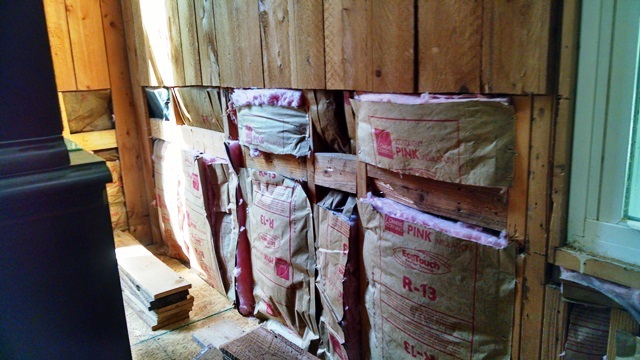 That will involve some painting, installing doors, trim and some flooring and replacing some wood plank walls that were cut out to remove wet insulation. Today we painted and caulked in the bedroom, painted and hung several doors and installed some baseboards and case molding. Sorry we didn’t get any pictures of the carpentry work. 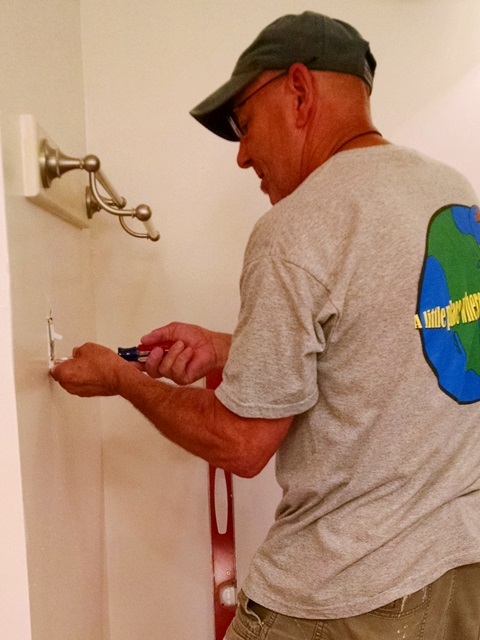 We met Jeff and Ann, the North Carolina United Methodist Disaster Recovery Coordinators. They were very nice and helpful. We will be working closely with them when we take over leadership. Jeff had their 8 week old Yorkshire Terrier with him and we got to play with her. Precious. He wouldn’t leave her with us. Oh well, maybe next time. 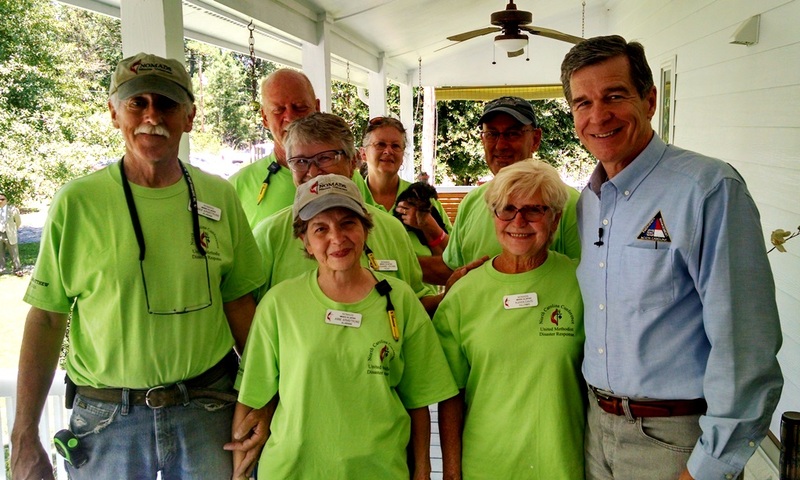 We also were visited by the security detail of North Carolina Governor Roy Cooper. 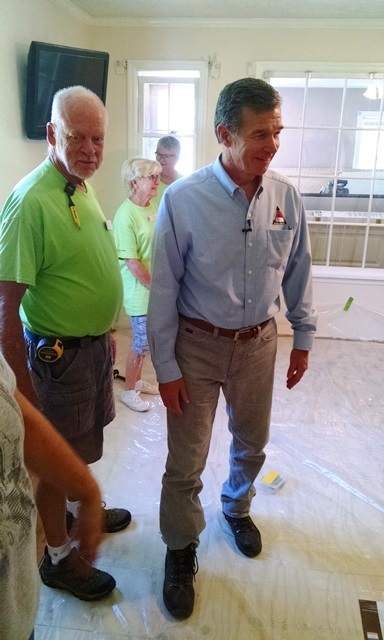 We understand Governor Cooper has a visit to our job site planned around lunch time Wednesday. It is a followup on the relief efforts for all the people affected by the flooding. We were told it is primarily a press opportunity to encourage more volunteers to come help the people of this area. They have already requested NOMADS return in the fall. Wednesday could be interesting but of course it could also all get canceled. We shall see. Today was Sunday so we got to go to church at a new church to us. 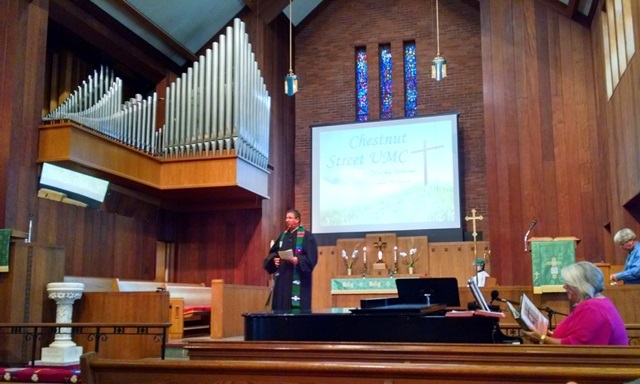 The team went to Chestnut Street UMC in downtown Lumberton. We all were really impressed with the friendliness and welcoming of the congregation. 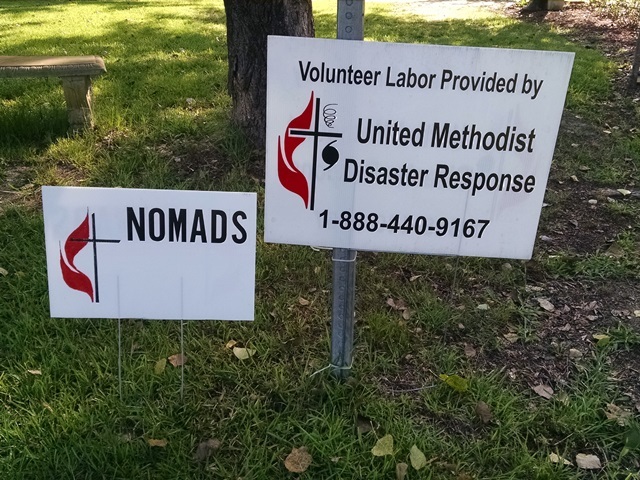 Chestnut Street is the sponsoring agency for NOMADS so the congregation knew about NOMADS and what we were are doing in town. Many of them thanked us for what we are doing in their community. The pastor is Rev Herbert Lowry who was also very welcoming and presented a wonderful sermon on baptism. We really appreciate the church’s support and encouragement. It was a joy to worship with them today. After worship we decided to have lunch at Pier 41 Seafood which is a locally, family owned restaurant in Lumberton. It was very good! Would definitely eat there again. We had various entrees such as seafood gumbo, oyster stew, fried shrimp and fried oysters. We are not eating much supper tonight. We spent the afternoon reorganizing the truck and loading the back with tools and painting supplies to be ready for work tomorrow. Then at 6:00 we hosted the team in Fred 2 for our weekly team meeting. Since five of us are new this week we had a time to get acquainted and then Mike, our leader this week, brought us up to speed on the work we will be doing. We currently have two houses assigned to us. 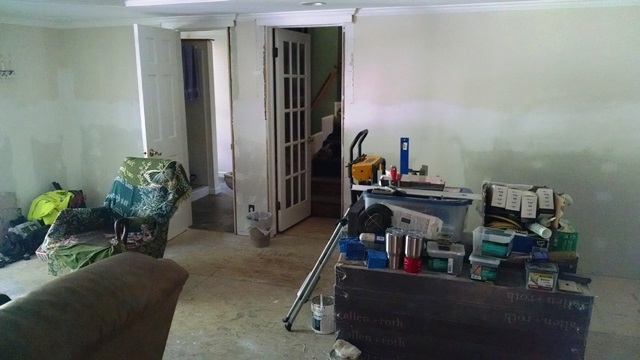 The first we will not be returning to until the plumber sets some fixtures then we will install the laminate flooring and that home will be complete. The second one we still have probably two more weeks work. 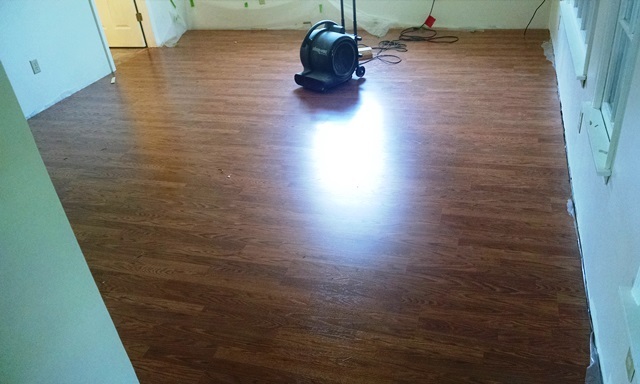 There is painting, trim work to be installed and laminate flooring to install and other miscellaneous tasks to be done. This is going to be another good and fun team. We look forward to a safe and productive week. After all the rain earlier in the week, today was a beautiful sunny day. As a matter of fact it was just plain hot and humid. This morning we had a wonderful (Constructors size) breakfast with Randy and Debra and then pulled out mid-morning in route for Lumberton, NC, leaving behind the wonderful 50 amp RV outlet Randy had installed for us. We will certainly enjoy using that on future visits. It took a long time to make the drive. There were four wrecks on I-20 with long traffic delays and then there was another delay due to what appeared to be a felony stop that closed one lane. There were 5 police cars on the scene when we passed a U-Haul truck and someone was in handcuffs. 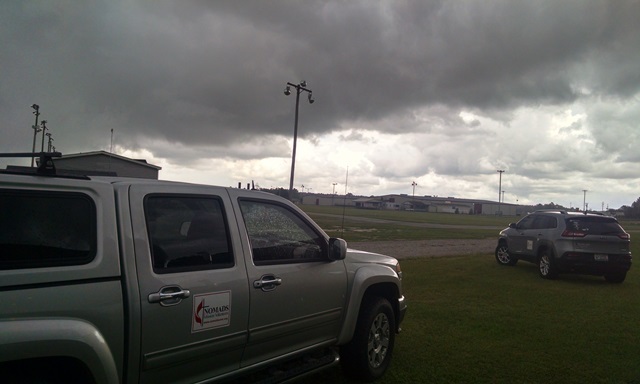 We were glad to finally pull into the Robeson County Fairgrounds and be greeted by our team leader for the next week. 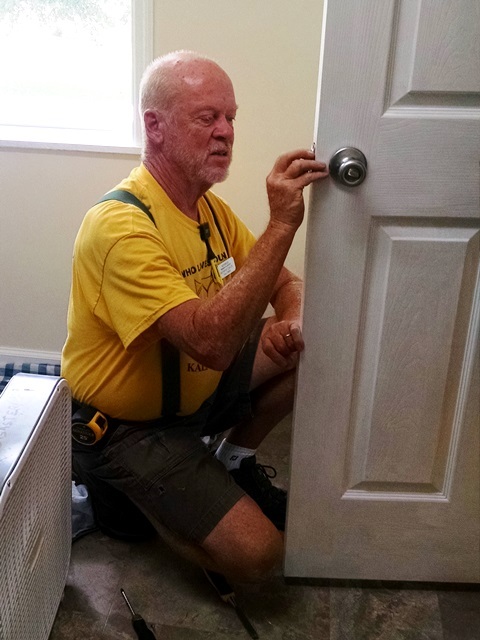 We will be in the Lumberton area for four weeks (leading the last three) working on a Disaster Rebuild project to assist in recovery from Hurricane Matthew. We understand that the area around Lumberton suffered extensive flooding from the storm. When Matthew made landfall in NC it was “only” a Category 1 storm but it was the massive amounts of rain that caused so much devastation. Many homes in Lumberton were over 4 feet under water. We met our other team members this afternoon and then went to Walmart to pick up a few things. A severe thunderstorm came through about the time we got into the store. The rain poured down. The power went off in the store momentarily and was off in the campground when we returned. Fortunately we have 6 large batteries in our new Fred so we really didn’t notice the outage except our air conditioners we not on when we returned. We didn’t really miss the air conditioning because the temperature had dropped over 15 degrees from when we left for Walmart. Power is back on now and everything is back to normal We are looking forward to a productive time here in Lumberton. 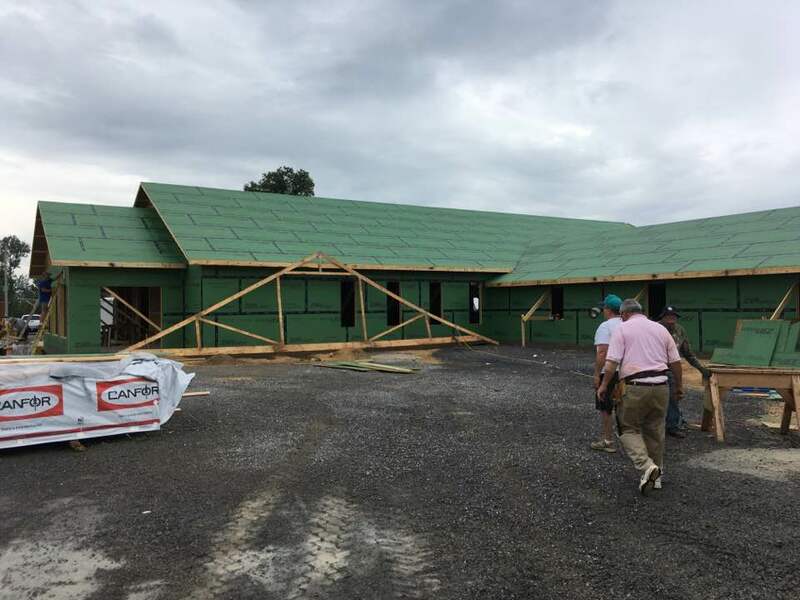 By the way, if you are on Facebook and would like to track the progress in the coming weeks of the Rosalie Baptist Church project. Go to Facebook and search for “Constructors for Christ“. You will find many more pictures and videos of the construction and volunteers.